Tony Tasset. “Arrow Painting 11,” 2015. Oil on aluminum panel, 42 x 66. “Me And My Arrow” is the latest solo exhibition by Tony Tasset featuring sixty-six “Arrow Paintings” alongside two “Arrow Sculptures.” A floor-to-ceiling painting installation, the exhibition forms a fascinating 360-degree panorama of grid-like compositions—an overwhelming burst of colors wherein similarities and contradictions seamlessly merge the realms of high art and popular culture. 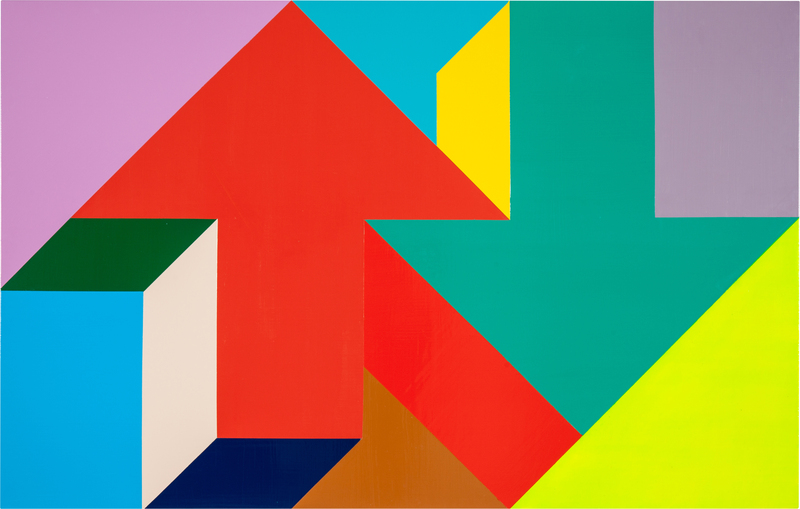 The brightly colored graphic interpretations of arrows painted on aluminum may be simple in symbolism—one arrow points up, the other one down—but a certain level of complexity emerges in taking into consideration their identical scale and almost identical imagery, as well as their positioning in the gallery space. Through the repetitive nature of this work and the iterative array of its chromatic combinations, the artist provides a cultural commentary that moves beyond pop art’s self-evident banality toward the dynamic, ever-evolving trends of the art world and, more broadly, contemporary pop culture’s waves of rising and falling trends and tendencies. Shifting the focus from the art world to more general notions of Americana, popular culture and its commodities, Tasset’s arrows force an uncomfortable look inward as they allude to feelings of disorientation and confusion prompted by the thumbs-up/thumbs-down, like/dislike patterns that have infused contemporary life online and offline. As a culture increasingly defined by dichotomies and an obsession with evaluating everything, “Me And My Arrow” gives grounds for self-awareness that is not limited to the viewers’ introspection but expands toward calling into question the world around them. Tony Tasset. Installation view of “Me and My Arrow” at Kavi Gupta Gallery, Winter 2016. 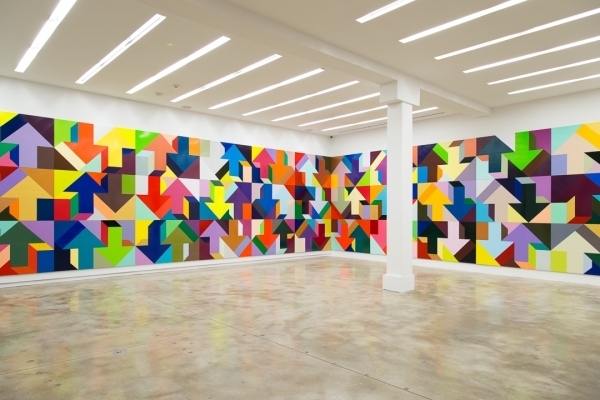 Tony Tasset’s “Me And My Arrow” shows through May 14 at Kavi Gupta Gallery, 219 North Elizabeth.